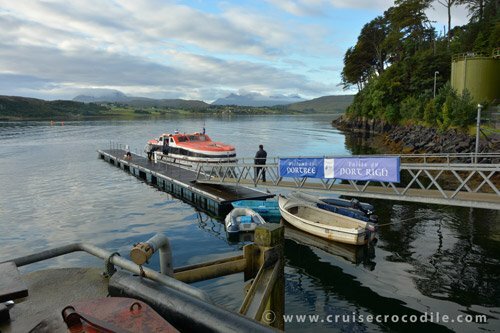 Our Portree cruise port guide gives you information about the docking location, cruise dock, transportation options and much more! Welcome to the Portree Cruise Port Guide. Portree is the capital of Scotland’s 2nd largest island: Skye. Portree has approximately 2300 inhabitants, which is about a third of the entire population of the Isle of Skye. 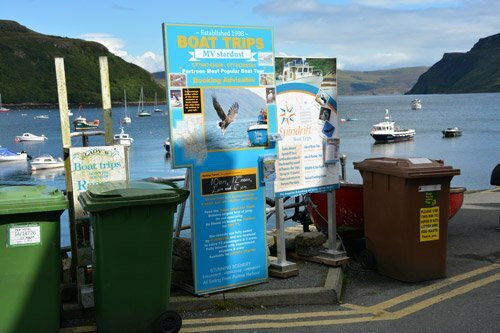 Portree is the largest centre of the island and almost all services are located here. The beauty of the Isle of Skye is famous around the world. The islands offers beautiful peninsulas, mesmerising bays, a mountainous centre and incredible wildlife. 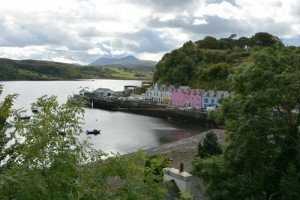 Make sure not to stay in Portree itself but discover the island! 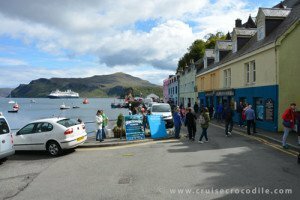 Your cruise ship will drop anchor in the bay in front of Portree. The small tenders will bring you to shore. This is the tender pier of Portree. You arrive in a simple harbour right at the iconic quay with colourful houses. 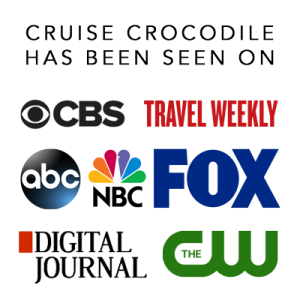 There are limited facilities at the cruise pier. Basically all your facilities like tourist information, public transportation, taxis etc are located in town, which is a small 800 meter walk. When you walk off the tender pier you will be on this street. 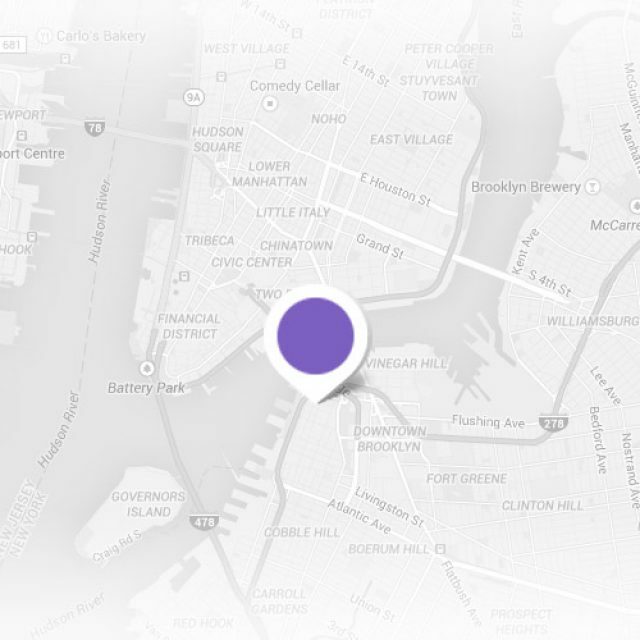 Find some simple restaurants and hotels here. As you walk towards town you will come across signs like these. They most often offer boat trips. The Isle of Skye does not offer a cruise dock large enough for cruise ships. 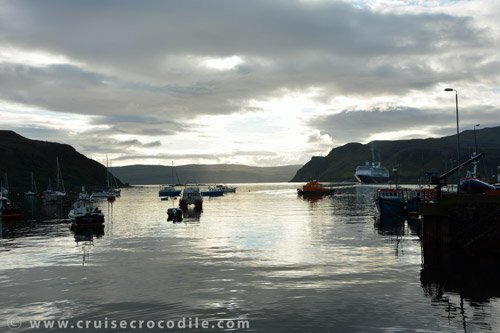 Therefore ships drop anchor in the bay in front of Portree and tender their guests ashore. 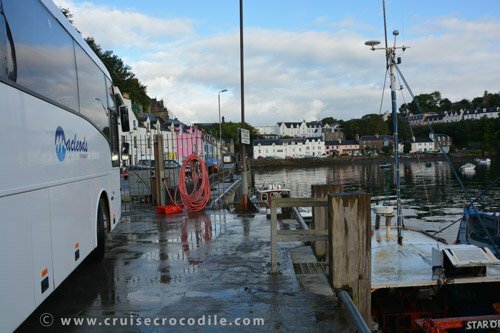 The tender pier lies directly at the famous pier with Portree’s coloured buildings along the harbour wall. From here it is a small walk to the centre of town (approximately 800 meters). Please know the walk includes stairs or a small uphill walk. Directly at the pier you will find a fish and chips store, some small tour operators offering boat trips, w-fi and a small bar. In town you will find some nice handicraft shops, the tourist information, the busstation and taxi stand. Find the tourist information of Portree in town. See maps above. Utilise them for any information you need about public transportation, taxis, car rentals etc. There are lots of spectacular hikes you can do around the island. A simple one starting in Portree itself is the Scorrybreac circuit. It is a beautifull walk around the bay just north east of town. First part is rather flat and great for a leisurely walk. The second part includes a steep hike up the hill. Total distance of the entire path is 3 km / 1,9 miles. From the cruise port you will need to keep right, follow the shore of the bay and look out for the wooden signs saying: Scorrybreac. It is easy to find and the path is well defined. Generally not available on the pier. There is a small taxi stand in town. The public bus is a good and rather cheap way to get around the island. Busses leave in the city centre. Check the bus schedule before you step into the bus, because there are often only a few departures per day. 60X West: From Portree Square to Dunvegan Castle. Takes about 1 hours and 15 minutes. Most often the bus makes a one hour stop here. This bus usually only departs 1 time per day (10.45 am) 57A: From Portree Square to the Museum of the Island Life and the Old Man of Storr Car Park. Departs every 2 hours. 56: From Portree Square to Dunvegan Castle Departs a few times a day. Wi-fi is available at the Pier hotel near the cruise pier. There are some amazing hikes you can do around the island. Some of those hikes even start in town like the Scorrybreac circuit. Check the information above for details. The centre of the Isle of Sky is dominated by the Cuillin Mountains. They are absolutely spectacular and dramatic mountain scenery. The highest mountain top is 3255 ft / 992 m. Out here you might come across birds of prey and wild deer. The only distillery on the Isle of Skye is called Talker Distillery. It proved 10 year old Single Matl Scotch Wiskey. Visit the distillery and see the 5 copper pot stills at work or take look at the oak casks in the warehouse. This is one of the most iconic castle of Scotland. The Eileen Donan castle is situated on an island at the point where three great sea lochs meet. The 6th century castle is surrounded by breathtaking scenery. There is no cruise dock large enough to accomodate cruise ships in Portree. Therefore your ship will need to drop anchor and tender you to shore. The tender pier is located on the most recognizable street of Portree. From here it is an easy, uphill walk to the city center. You will find limited facilities on the dock. Please check our Portree cruise port guide for all the information. This museum depicts life on the island around the 19th century. Several thatched cottages are preserved.